June 25, 2018 Business & Hospitality, Construction & Design Technologies, Events, Faculty & Staff, Industrial, Computing & Engineering Technologies, Nursing & Health Sciences, Sciences, Humanities & Visual Communications, Students, Transportation & Natural Resources Technologies Comments are disabled after 182 days. The hunger for knowledge continued for hundreds of young women and men who explored the hands-on world of Penn College’s summer camps mere weeks after their school year ended. Architecture Odyssey campers pause for a group photo on the steps of the college’s Victorian House. Current students assisting the camp were Olivia Kleman (far left), an architectural technology student from Shamokin, and Riley Ferro (far right), of Berwick, a 2018 architectural technology grad and a building science and sustainable design student. Striking a pose in the Victorian House’s second-floor rotunda are Architecture Odyssey campers. … as campers wheel off to tour Williamsport’s historic district and downtown (where they also enjoyed dinner and ice cream). Family dinner? Architecture campers enjoy the Victorian House dining room along with their camp leaders, Daniel L. Brooks (far left), architectural technology instructor, and Naim N. Jabbour (far right), assistant dean of construction and design technologies. Laughter fills the air as Connections Links (orientation leaders) and high school students participating in the Autism Spectrum Postsecondary Interest Experience enjoy a social activity on the Keystone Dining Room’s outdoor patio. With the help of a beach ball featuring fun questions, an ASPIE camper enjoys a lighthearted ice-breaker. During the Automotive Restoration Camp, Paul J. Rose, laboratory assistant for automotive restoration technology, guides a camper through sewing a seam in her upholstery project. Shaun D. Hack, instructor of collision repair, gives each camper instruction in pinstriping. Wayne Sager, of the West Branch A’s chapter of the Model A Restorers Club, discusses the features and history of a 1929 Ford Model A. Three Model A owners brought their vehicles to the Automotive Restoration Camp: Alfred Reeves, James Baskin and Dale Hoover. A camper carefully adds tape to the flames he painted before adding pinstripes. Behind the wheel in a Model T.
With guidance from Roy H. Klinger, instructor of collision repair, campers drive a Ford Model T around the parking lot. An Automotive Restoration camper finishes a metal-forming project. New this year, Aviation Camp offers ample opportunities for exploration by adventure-seekers. Decked out in an appropriate “Born to Fly” T-shirt, an Aviation Camp teen works with composite materials. Aviation campers check out the cockpit of the college’s twin-engine Dassault Falcon 20 business jet. 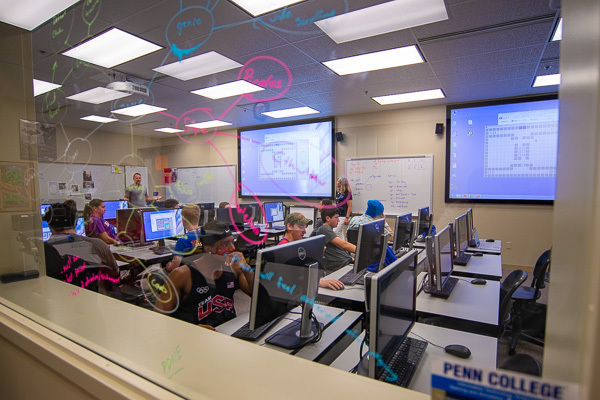 A college gaming lab serves as an inspiring space for the Designing a Digital Future Camp. A highlight of the college’s summer camps: fun experts like Spyke M. Krepshaw, web and interactive media instructor. In an electronics and computer engineering technology lab, a camper listens intently to instruction. … and is rewarded with a precision-cut Wildcat keychain keepsake. A musician learning to weld! A camper displays the artwork he sketched prior to applying a torch to it. Sparks fly in the welding lab. Fittingly clad in a NASA T-shirt, a camper crafts a Popsicle-stick skyscraper in engineering design technology. Engineering campers enjoy the creation of flying discs. Before serving a meal for their families in Le Jeune Chef Restaurant, Future Restaurateurs campers gather with their faculty and staff mentors: Chef Todd M. Keeley, instructor of baking and pastry arts/culinary arts, and Danna M. Brooks, dining services manager (both on left); and Chef Charles R, Niedermyer, instructor of baking and pastry arts, and Chef Frank M. Suchwala, associate professor of hospitality management/culinary arts (both on right). Photo courtesy of Brian D. Walton, assistant dean of business and hospitality. Niedermyer shows campers how to use an immersion blender to make ganache. A camper mixes chocolate ganache to top a red velvet cake. Future Restaurateurs campers get a hands-on science lesson as they flash freeze snack foods in liquid nitrogen. During a session using modernist kitchen techniques, Suchwala demonstrates the vaporization of liquid nitrogen. A camper portions the filling for key lime desserts that will be served to parents and other guests at a camp-ending dinner. Nicholas L. Stephenson, graphic design instructor, offers a constructive critique. Campers learn the art of presentation and creative brainstorming while sharing their initial pen and pencil designs. A camper poses with her “gig poster” at the finale. Before departing campus, a mom captures a memory of three roommates at their graphic design student show. Students in the Grow & Design Horticulture Camp take pride in their floral arrangements. Karen R. Ruhl, a part-time horticulture faculty member and alumna, aids a camper in assembling a bow from ribbon. Crafting with carnations! Ruhl and campers work with floral tape to fashion boutonnières. Health Careers Camp participants practice their skills at laparoscopic surgery as they learn about the careers of surgical technologists. Campers take a break from positioning their “patient” for an X-ray. Included in the photo are Tiana F. McCormick (left) of Williamsport, who is scheduled to earn an associate degree in radiography in August, and Karen L. Plankenhorn (second from right), clinical supervisor of radiography. Tammy S. Clossen, assistant professor of dental hygiene, discusses the work of a registered dental hygienist while demonstrating a typical prophylaxis session. Jessica L. Bower, nursing simulation lab coordinator, walks campers through the insertion of a nasogastric tube in one of the nursing program’s three dozen mannequins. Campers show off the results of their handiwork during a session in the Dental Hygiene Clinic. Plankenhorn (left) and McCormick (right) help a camper to position both a mannequin and equipment for a head X-ray. Campers mingle with physician assistant students. Photo by Christopher J. Leigh, video production coordinator. During the SMART Girls Showcase, campers’ posters show off their resumes, the results of an interest inventory and research on a variety of careers. A team shows off its weeklong project: a robot with a variety of sensors that they assembled and programmed to navigate a maze, follow a line, make drawings and stack boxes. On Day 1, SMART Girls dive into to assembling their robots. Collaboration is key on the four-girl teams. A camper designs a business card for her Showcase presentation. When two hands are not enough, teammates are ready to help. A robot runs its program. Campers file into the Klump Academic Center Auditorium on June 18 for an all-camp evening activity. On their way to a scavenger hunt are these campers led by Joseph M. Morrin (far left), summer conference assistant and graphic design student. Penn College’s main campus serves as a beautiful backdrop for visitors. Have Penn College backpacks, will travel … across campus. Campers traverse their picturesque surroundings. Another group poses on the campus mall. At the end of the day, campers walk back to Dauphin Hall to dine in Capitol Eatery. After lunch in KDR, Daniel W. Yoas (at front), associate professor of information technology, leads Digital Future campers back to the ATHS. Another group of Digital Future campers stops on the mall for a commemorative shot. Campers walk into the Breuder Advanced Technology & Health Sciences Center. SMART Girls have fun between lunch and lab. Framed by summer beauty are these SMART Girls at the floral feature outside College Avenue Labs.